World University Service of Canada (WUSC) is a leading Canadian international development organization that works with and through its southern partners to promote sustainable development. 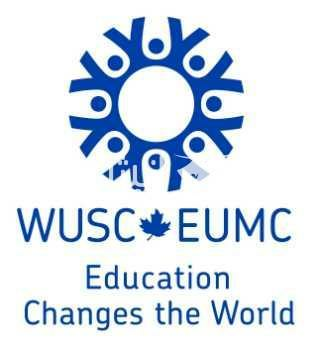 Founded in 1957 and currently working in 22 countries worldwide with an annual budget of approximately $45 million dollars, WUSC works towards a world where young people can grow up in safe, secure, supportive environments, where they can learn, work and play a vital role in their community and country’s development. Our internationally recognized programs support youth, women and other marginalized populations, focusing on three thematic areas of education, employment and engagement. Globally, WUSC works with a network of higher education institutions, civil society organizations, private sector partners, professionals, students, volunteers, faculty and community leaders that can be leveraged to support our work. WUSC and its consortium partner the Canadian Leaders in International Consulting (CLIC) are implementing the Women’s Economic Linkages and Employment Development (WE LEAD) project in Jordan. WE LEAD, a project funded by Global Affairs Canada, aims to increase women’s empowerment for sustainable economic growth; this will be achieved through activities focusing on women’s employment by businesses and the reduction of gender specific barriers to women entering into and remaining in the workforce. The WE LEAD project will be implemented over a period of four years, from March 7, 2017 to March 31, 2021 in three governorates (East Amman, Irbid and Salt) in Jordan. The Logistics Assistant (LA) will perform a varied range of logistical and administrative tasks to deliver an efficient cost-effective and quality service and support World University Service of Canada (WUSC) Jordan office and the WE LEAD project. The LA is expected to assist in managing the transport requirements of WUSC’s Jordan office including the day to day management WUSC’s vehicle(s) and drive WUSC’s primary vehicle. In addition, the LA will be undertaking administration tasks requiring journeys outside of the office. The driver is responsible for any vehicle he/she is driving, transporting authorized WUSC personnel on official duty and cargo to the points of destination. This includes collecting documents/goods from partners and suppliers. The driver is responsible for the day-to-day maintenance of his/her designated WUSC vehicle(s). This includes checking of oil (engine & brakes) and water (battery), adjusting Gas pressure as well as ensuring that all required tools in the vehicle are functional and available. The driver is responsible for the safe-keeping of tools and documents kept in the vehicle. Any damage or loss must be reported immediately. The driver is responsible for the designated vehicles being representative and clean (interior as well as exterior) at all times. The driver shall follow the schedule of servicing of the designated WUSC vehicles. Carry out multi-drop deliveries in a timely and safe manner. To create, maintain and update list of useful suppliers. To liaise with the program officer whenever maintenance of office facility is required or in case of security and safety issues are raised and logistical assistant is needed. Provide efficient support to all staff, volunteers, and visitors through facilitating arrangements related to visas extensions /residency permits etc. Undertake any other tasks assigned by the direct supervisor. To assist in labeling WUSC office fixed assets. Must hold a valid Jordanian driver’s license. Experience in working with NGO/INGOS or with regional/local development agencies. Adhere to all of WUSC policies and procedures. Completion of High School or college is required, including a reasonable knowledge of English and math. Knowledge of vehicle mechanics can be helpful. WUSC is an equal opportunity employer, both Male and Female candidates may apply for this position. Please send Resume/CV and Cover letter to email: jordan@wusc.ca . ONLY short listed candidates will be contacted. It is Mandatory to mention the position you are applying for in your email subject. No Phone Calls are accepted.